Sachin Tendulkar created history on Wednesday, becoming the first cricketer to score a double century in one-day internationals after a breathtaking unbeaten 200 that steered India to a massive 401 for three against South Africa in the second One-Day International in Gwalior. The master batsman treated the capacity crowd at the Captain Roop Singh stadium to a stunning exhibition of strokeplay in 147-ball knock during which he not only registered his 46th ODI century but also posted the highest score in one-dayers, eclipsing the previous record of 194 which was jointly held by Pakistan's Saeed Anwar and Zimbabwe's Charles Conventry. 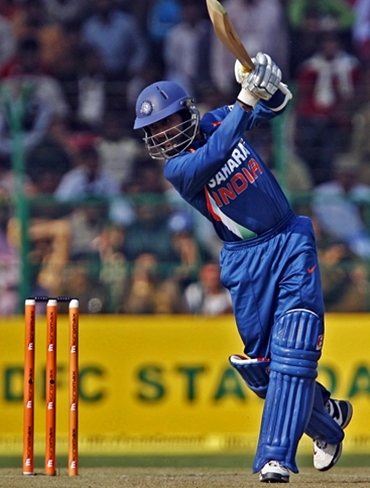 Dinesh Karthik played the perfect partner to Tendulkar. He kept the scorer busy with good running and found the boundary regularly. The pair did not spare any bad ball and in just 10 overs India had put up 74 runs on the board despite losing Virendra Sehwag early. South Africa also lost a couple of their men due to injuries while fielding. 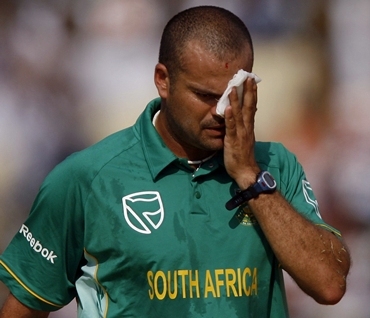 First, J P Duminy was injured the webbing on his left hand and after a few overs Charl Langeveldt sustained a cut above his left eye as he slipped while attempting to field a drive off Tendulkar. South Africa's opening bowlers were made to look pedestrian as they leaked 78 runs in their first spells. Tendulkar hit just four fours to reach 100 from 90 deliveries but opened up after reaching the three-figure mark as he lofted Duminy over long on for his first six after hitting Jacques Kallis for a four in the previous over. He completed his half-century, his 94th in ODIs, off just 37 deliveries with a flicked boundary through fine leg off Roelof van der Merwe in the 12th over of the innings. Tendulkar's previous best was an unbeaten 186 against New Zealand made at Hyderabad in 1999. Along with the Mumbai batsman, Charl Langvedt went into the history books as Tendulkar achieved the amazing milestone off his bowling. Tendulkar steered Langveldt to the off side to get to the magical figure and the packed stadium went into a frenzy. The crowd went into raptures when Tendulkar took a double on the leg side off Parnell in the 46th over to reach 196 from 141 deliveries and register the highest score in ODIs. He then completed the first double century in One-Day Internationals with a single on the off-side. It took the master batsman just 147 deliveries and he slammed 25 boundaries and three sixes to send the entire country into celebration. S Sreesanth was India's most successful bowler, claiming three for 49 in seven overs, while Ravindra Jadeja (2 for 41), Yusuf Pathan (2 for 37) and Ashish Nehra were also among the wickets for the hosts. The Kerala speedster bagged the vital wickets of Roelof van der Merwe, Hashim Amla and Dale Steyn. 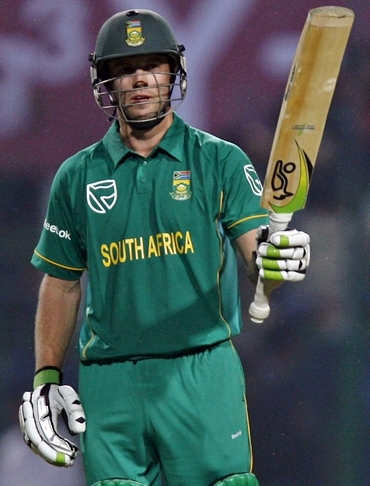 A B de Villiers smashed an unbeaten 114 from 101 deliveries before South Africa were dismissed for 248 in 42.5 overs. The victory also saw India take an unassailable 2-0 lead in the three-match series. De Villiers waged a lone battle, completing his century off just 85 deliveries, inclusive of 11 boundaries and two sixes, as South Africa scored 227 for nine after 39 overs, needing another 175 runs from the last 11 overs.